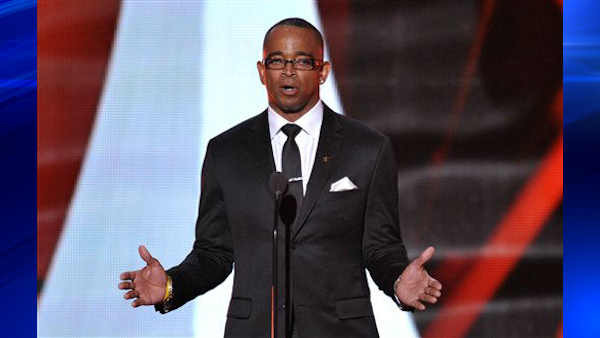 CHAPEL HILL, N.C. (WTVD) -- Stuart Scott, the longtime "SportsCenter" anchor and ESPN personality known for his enthusiasm and ubiquity, died Sunday. He was 49. Scott had fought cancer since a diagnosis in late 2007, the network said, but remained dedicated to his craft even as he underwent chemotherapy, radiation and surgery. Stuart Scott, the longtime "SportsCenter" anchor and ESPN personality, died Jan. 4, 2015. He was 49. ESPN President John Skipper said in a statement that Scott was "a true friend and a uniquely inspirational figure" and that his "energetic and unwavering devotion to his family and to his work while fighting the battle of his life left us in awe, and he leaves a void that can never be replaced." Click here for ESPN's tribute to Stuart Scott. Scott accepted the Jimmy V Perseverance Award at the ESPYs in July. During his speech, he told his teenage daughters: "Taelor and Sydni, I love you guys more than I will ever be able to express. You two are my heartbeat. I am standing on this stage here tonight because of you." Born in Chicago, Scott attended high school in North Carolina and then the University of North Carolina. While a UNC student, Stuart interned at ABC11 with longtime WTVD anchor Larry Stogner. "Broken-hearted. Just heard of Stuart Scott's death," Stogner said. "I approved and aired the first story he wrote for broadcast. Remained friends through the years with this outstanding talent, innovator, father and human being." "He credited Larry with teaching him how to write," said ABC11 News Director Rob Elmore. "Stuart never forget those early lessons and we will never forget his impact on sports, television and life." After graduating from UNC in 1987, Scott worked at three TV stations in the southern U.S. before joining ESPN for the 1993 launch of its ESPN2 network. He often anchored the 11 p.m. "SportsCenter," where he would punctuate emphatic highlights with "Boo-ya!" or note a slick move as being "as cool as the other side of the pillow." Scott went on to cover countless major events for the network, including the Super Bowl, NBA finals, World Series and NCAA Tournament. He also interviewed President Barack Obama, joining him for a televised game of one-on-one. In 2001, Scott returned to Chapel Hill as the university's commencement speaker. "Our hearts go out to Stuart Scott's family and friends, including his daughters Taelor and Sydni, and his colleagues at ESPN. He loved his home state and his alma mater. Stuart taught us that sports is about joy and laughter, not just achievement and results. More important, he showed us how to fight with dignity and honor. He blazed a path in broadcasting that is often imitated, but never duplicated. His legacy will live on in many ways - as a friend, a son, a father, a professional and forever, a Tar Heel. All of us at the University he loved so richly feel a profound sadness in his passing. We will miss him but we will honor his memory and continue the fight he endured so bravely." Scott was first diagnosed with cancer in November 2007 after he had to leave the "Monday Night Football" game between Miami and Pittsburgh to have his appendix removed. Doctors discovered a tumor during surgery. He underwent chemotherapy again in 2011. Scott made a point of continuing to live his life - at work and outside of it. "Who engages in mixed martial arts training in the midst of chemotherapy treatments?" Skipper said in ESPN's statement. "Who leaves a hospital procedure to return to the set?" Susan Braun, CEO of The V Foundation, told ABC11, "He kept living his life, he did not stop because of what he was faced with and showed us all the meaning of what a full life is, even when you're looking death in the face." Scott is survived by his parents, O. Ray and Jacqueline Scott; siblings Stephen Scott, Synthia Kearney and Susan Scott; his daughters Taelor, 19, and Sydni, 15; and girlfriend Kristin Spodobalski. "I will miss Stuart Scott," said President Barack Obama in a statement Sunday. "Over the years, he entertained us, and in the end, he inspired us - with courage and love. Michelle and I offer our thoughts and prayers to his family, friends, and colleagues." As Scott accepted the award named for former N.C. State coach Jim Valvano, who died of cancer in 1993, he noted: "When you die, that does not mean that you lose to cancer. "You beat cancer by how you live, why you live, and the manner in which you live," Scott said. "So live. Live. Fight like hell. And when you get too tired to fight, then lay down and rest and let somebody else fight for you." "Stuart was a strong advocate for cancer research and an articulate spokesperson about the realities of cancer. His powerful spirit buoyed all of us, in sickness and in health," The V Foundation said in a released statement. The organization said one of his favorite things to do was get together and thank the volunteers by going to sing karaoke with them after events. "Stuart was so amazing," said Pam Valvano Strasser, V Foundation Chairwoman. "He was always there to help and support." She went on to say, "Even knowing Stuart was very sick, it's hard to believe we've lost such a dear friend." "He has meant so much to us. That feeling that you have when you lose someone as dearly as him feels like today is outside, rainy, damp gray," Braun told ABC11. "He never gave up he didn't lose, he died from cancer but he didn't lose." "We vow to keep up the fight to end cancer. For Stuart. For everyone touched by these dreaded diseases. And we send our deepest sympathies to Stuart's loved ones, and to all who grieve the loss of this great man," The V Foundation said in the statement. In lieu of flowers, Scott's family is asking people donate to The V Foundation. Every cent will go toward lifesaving cancer treatment research. Click here to donate.